Roving Bandit: More of the same? Take a long hard look at these 2 charts. Afghanistan could have faster economic growth than any country has ever had, and incomes would still not approach US levels for over 50 years. 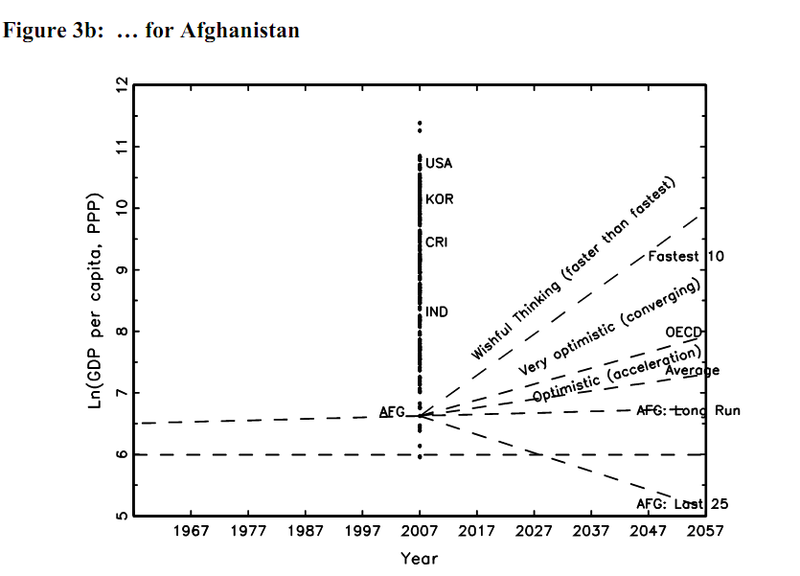 The charts are from Lant Pritchett (this paper, for more see this podcast and this video). So - what should we do? I dunno, have as a goal and measure things other than income, which are not necessarily strong correlates with income, but nonetheless very useful..? That's probably part of it, ala Charles Kenny's "getting better", but is that enough? I like the idea of focusing on measures other than income: mortality, returns to education, cost of education, inter-income mobility, etc. I haven't read the Pritchett paper in any detail (listened to the podcast), but I'm guessing that the incomes of the US, India, etc. are all exogenous in his forecasting model. How would endogenizing these parameters affect the forecasts? Unless one genuinely believes that the world pie can be grown ad infinitum, surely the degree to which we can get the "wishful thinking" path is impacted by the desire to which other countries are set on less promising paths of their own. I think the main point they are trying to make is to moderate donors' expectations about what a 'successful' reform trajectory looks like and to emphasise that most reform projects operate on way, way too short a time scale. Even the fastest reformers in the existing dataset (i think they cite Indonesia?) did not move as quickly as many, often fragile, LDCs are expected to in donor programming and conditionality. If thats right, then the inference that 'because even on the best case scenario things will be slow we need to start targeting something else' is beside the point. Anonymous I think you are right on the data, but is that really an adequate response to the data? 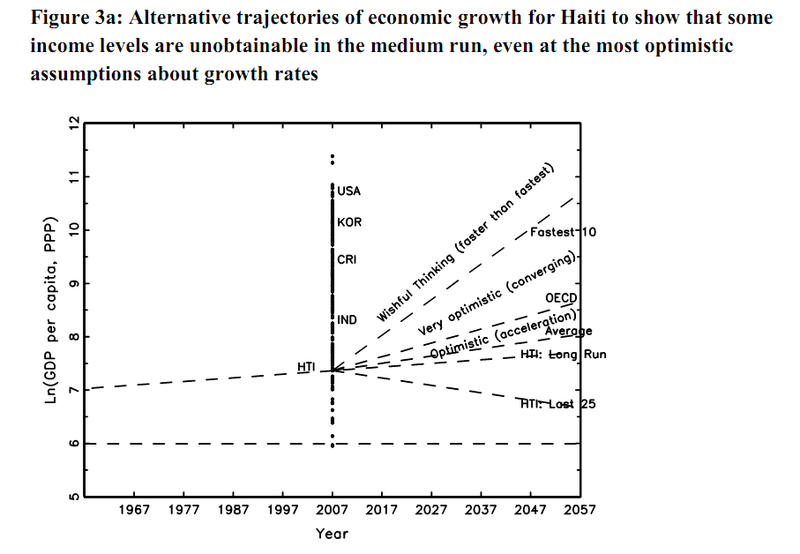 "Hey DFID, USAID, you are being too optimistic with your 5 year horizons, you just have to accept that Haitians and Afghanistanis are going to be stuck in low-income weak states for at least 50 years?" 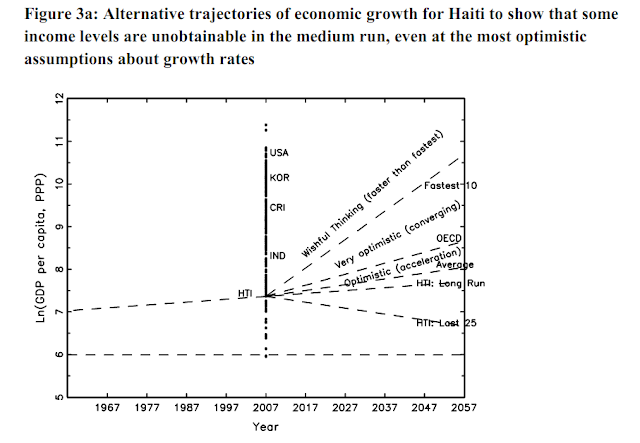 "Haitians and Afghanistanis are going to be stuck in low-income weak states for at least 50 years?" Now, that doesn't mean the conditions have to be bad in absolute terms. They could improve to a level of a decent minimum standard if the countries make all the right moves and take good advice. Alas, unlikely. But long term, they will probably always be near the bottom in relative terms.